If I was stranded on an island and could only eat one thing, it would be chocolate smoothies. Who doesn’t love chocolate? It’s the feel good food. To be clear, the kind of chocolate I’m referring to is the raw form, or cacao. Standard store bought chocolate syrups and powders will quickly turn a healthy smoothie into a junk food drink. Raw chocolate is a nutrient dense superfood. Below are some of main reasons why. If you weren’t already, hopefully now you’re sold on cacao; so let’s get to the smoothie recipe. Enjoy! 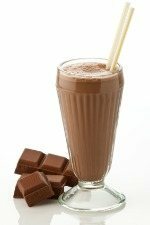 I would love to know if you try this chocolate lovers smoothie – please leave a comment below. Happy Blending! For more information and actual research studies on the health benefits of cacao, click here. Hi,I love chocolate and I am going to make this chocolate lovers smoothie on June 30 for lunch,and after I finished drinking your smoothie,and I was full for a little while after I drank your vanilla thrills smoothie at lunchtime.I also have all of the ingredients for your chocolate lovers smoothie.I will let you know how much I enjoy your smoothie tomorrow. Just getting a chance to reply to your comment, Kim. I hope you enjoyed this chocolatey smoothie!